Ok, now this is a teaser poster. As you might recall I was a little surprised with the first few Spirit posters because they were visually underwhelming and I was expecting something stunning, like the kind of thing we got from 300 and Sin City. Not that the posters were bad exactly, but they did use a subtle approach that is dangerous considering that this is a film without big stars and about a character that isn’t exactly famous anymore. And yes, I know those were teaser posters and they shouldn’t show too much, but that doesn’t mean they shouldn’t be trying to make a strong impression. This new poster, on the other hand, is exactly the kind of thing I was expecting. It’s very reminiscent of the posters for Sin City, but even more stylized and closer to looking just like a comic book. It still doesn’t reveal much about the story, the characters or even about what the movie is going to look like. But it does give us a better idea about those things and is most definitely an eye catcher. 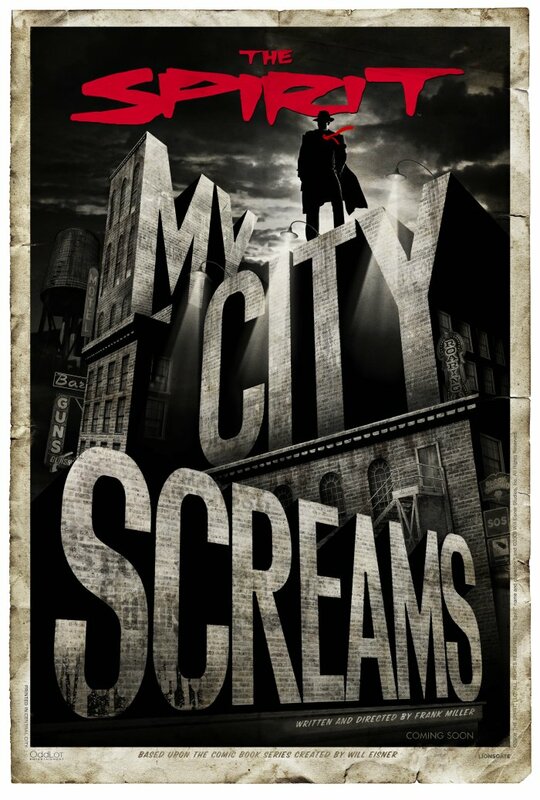 And the way it integrates the “My City Screams” catchphrase into the image? Just brilliant. You can bet people looking at the poster won’t forget it so soon. I think I like this more than I liked any of the Sin City posters. Those were great, but this takes that creativity and those visuals one step beyond. Of course, the danger of this type of poster is that people might feel like they have seen something just like it before. As I mentioned in the last post, this is a problem I feared the campaign might run into. But this poster is so beautiful that I’m feeling more confident that this won’t be a big problem after all. I’m not so sure about this movie but the poster is really great! If you’re familuar with the artwork of Will Eisner, the Spirit’s creator, it’s a great homage to his golden age comic book art…very nice!